WASHINGTON — The National Education Association has recognized and honored those who have fought — and continue to fight — for human and civil rights at a moving and inspiring awards gala since 1967. This year, NEA will thank and honor the outstanding work of Hinaleimoana Wong-Kalu and 12 of America’s social justice heroes at its annual Human and Civil Rights Awards Dinner on July 3 in Washington. NEA will also recognize the 50th anniversary of its merger with the American Teachers Association. ATA, which represented Black teachers in segregated schools, originally created the Human and Civil Rights Awards Dinner. As part of the merger, NEA agreed to carry on this important tradition. 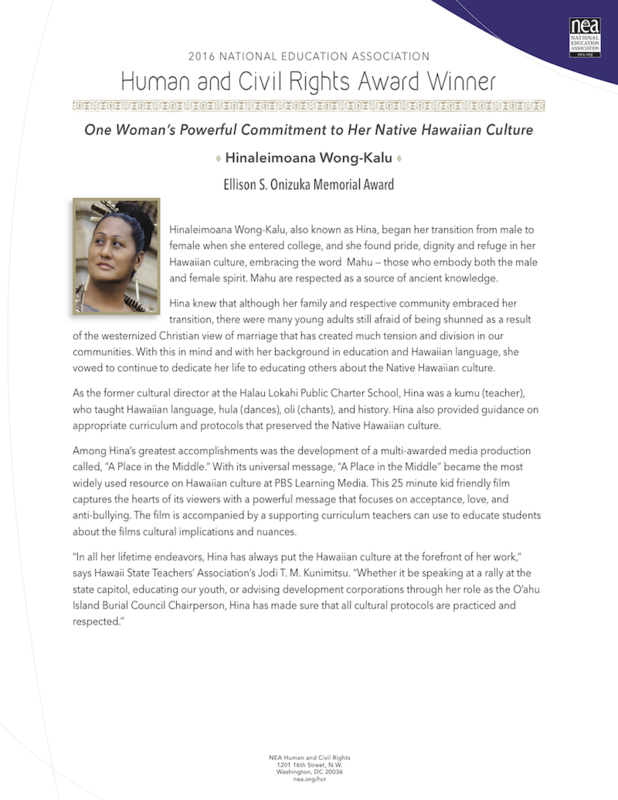 A native Hawaiian, Hinaleimoana Wong-Kalu, also known as Hina, is a dedicated kumu (teacher) and this year’s recipient of the NEA Ellison S. Onizuka Memorial Award for her work in educating others about Native Hawaiian culture. Stemming back to her first years in college, where Hina began her transition from male to female, Hina knew that although her family and respective community embraced her transition, there were many young adults still afraid of being shunned as a result of the westernized Christian view of marriage. Finding pride, dignity and refuge in her Hawaiian culture, Hina wanted nothing more than to share her culture with others. With her background in education, she taught Hawaiian language, hula (dances), oli (chants), and history. Hina has also provided guidance on appropriate curriculum and protocols that preserve the Native Hawaiian culture. Among Hina’s greatest accomplishments is the development of a multi-award winning PBS production called “A Place in the Middle.” Through this 25-minute kid-friendly film, viewers are left with a powerful message that focuses on acceptance, love, and anti-bullying. The film has gone on to be the most widely used resource on Hawaiian culture at PBS Learning Media. Whether it’s teaching hula or sharing her journey through a multi-award winning film, Hina has made it her mission to always place her native Hawaiian culture at the forefront of all her endeavors. To view full bio, click here. For a full list and bios of this year’s winners please visit here.